Sudbury’s major fundraising event is our annual Women of Distinction Awards Gala. Proceeds from this event will help support the work and programs of the YWCA Sudbury, especially our new conference initiative, “The Power of Being a Girl”. Many schools would like us to offer this program to their students. 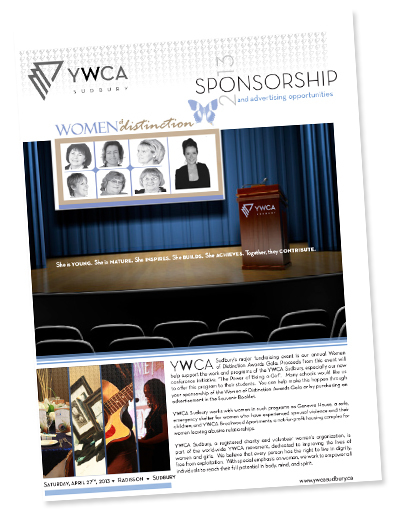 You can help make this happen through your sponsorship of the Women of Distinction Awards Gala or by purchasing an advertisement in the Souvenir Booklet. YWCA Sudbury works with women in such programs as Genevra House, a safe, emergency shelter for women who have experienced spousal violence and their children; and YWCA Brookwood Apartments, a not-for-profit housing complex for women leaving abusive relationships. YWCA Sudbury, a registered charity and volunteer women’s organization, is part of the world-wide YWCA movement, dedicated to improving the lives of women and girls. We believe that every person has the right to live in dignity, free from exploitation. With special emphasis on women, we work to empower all individuals to reach their full potential in body, mind, and spirit.